I've been knitting like a fiend to make the deadline for the photo shoot. What on earth possessed me to propose a poncho! It is done and I am making good progress on the tunic but it will be a close thing. Please photograph your swatches, front and back, before sending them. There are two reasons for this. I will email you my letter as soon as I review your work and, depending on where you live, it will take awhile to get the swatches. Also, sometimes the swatches just don't arrive. One thing I've noticed lately in many of the swatches is how the selvedge stitches curl under and for the Masters Program we want them flat. There are a lot of reasons for this. It is a very good habit to develop. Flat selvedges make finishing MUCH easier. For the Masters swatches, it helps the knitter (and reviewers) see if there is a tension issue at the selvedges which is a common issue. If you can't see it, you can fix it. I took a close up photo of one of my current projects as it was blocking. Notice that I've flattened out the selvedge stitch and pinned them at an angle so the edges will dry that way. By the way, dental elastics mark the locations of decreases. I am so bad at taking notes when I design that I've learned that writing the pattern is much easier when I "annotate" like this. The poncho uses the tubular cast on and bind off techniques. When I went to do the bind off I couldn't think of how to get started. I checked my own videos and realized all of them show how to do this in the round since I use this technique mainly for socks or necklines. This tip rectifies that omission. The preparation for a tubular bind off is basically the same for both circular and flat knitting. The stitches in two to four rows are alternately slipped. If you are working flat, you generally work the knit stitches and slip the purl stitches with the yarn in front (provided you are working an even number of stitches) for all rows. You can't do that for circular knitting. 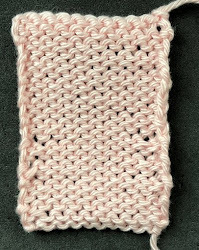 On the first round you work the knit stitches and slip the purl stitches and reverse this for the next round. Here is a link showing how to do this: Preparing for Tubular Bind Off. When you do the bind off in the round, you begin with a purl stitch and you can adjust your stitches so that a purl stitch is first. For flat knitting the first stitch is generally a knit stitch and you can't just shift it to the right. You have to work it separately. To get started (after you've cut the yarn and threaded up a tapestry needle) you insert the tapestry needle knitwise into this stitch, pull the yarn tight and drop this stitch off the needle. From here on the process is the same as for circular knitting. Step 1--Insert the tapestry needle knitwise into the purl stitch. Pull the yarn tight. Step 2--Insert the tapestry needle purlwise into the knit stitch you dropped and into the knit stitch to the left of the purl stitch and pull the yarn tight. Step 3--Insert the tapestry needle purlwise back into purl stitch and pull the yarn tight. Drop the stitches from the needle. You just repeat this until the end. I won't be having salon again this weekend. Hopefully soon! I finally finished the poncho. You can wear it two ways. I've finished the fronts and back of the tunic I'm doing. It is going to have a duplicate stitch design so I'm not going to seam it until I've done that. The sleeves will be picked and worked from the shoulder down.